Directors – Grant Harvey, Steve Hoban & Brett Sullivan, Screenplay – Sarah Larsen, James Lee, Doug Taylor & Pascal Trottier, Producers – Steve Hoban & Matt Smith, Photography – Gavin Smith, Music – Alex Khaskin, Visual Effects – Keyframe Digital Productions Inc. (Supervisor – Darren Cranford), Special Effects Supervisors – Mark Ahee & Ben Borean, Makeup & Creature Effects – Form & Dynamics (Designer – David Scott), Production Design – Tom Bider. Production Company – Copperheart Entertainment/Telefilm Canada. 1:– On Christmas Eve in the town of Bailey Downs, radio talkshow host Dangerous Dan proceeds to get drunk on air throughout the course of the evening. Meanwhile, one of Santa’s elves has died following an accident and comes back to life as a zombie. With it infecting the others, Santa now finds himself facing a horde of zombie elves. 2:– On Christmas Eve, a group of teenagers break into St Joseph’s Academy, looking for evidence to make a video documentary about the death of two pupils, only to stir up something supernatural. 3:– Taylor insists that his wife and children come with him to visit the severe Aunt Edda at her grand old mansion. There the youngest Duncan breaks a statuette and they are thrown out. On the way home, the car skids off the road and they are forced to continue on foot, only to be pursued and attacked by the spirit of Krampus. 4:– Police officer Scott Peters, his wife Kim and their young son Will sneak into private forest to cut down their own Christmas tree. Will becomes lost but they find him again. Once back home however, they find there is something increasingly wrong about Will and come to realise that he has been replaced by a changeling. Almost every second Christmas season sees the release of some Yuletide-themed film and even more in the way of insipid Christmas-themed made-for-tv movies. I have reviewed many of these here but get switched off by the treacly family sentiments and can’t seem to dredge the enthusiasm to watch the tv offerings, which are the worst offenders. On the other side of the coin, there is a whole sub-genre of anti-Christmas films. These range from the Gothic beauty of Henry Selick’s The Nightmare Before Christmas (1993) to the gleeful mean-spiritedness of Bad Santa (2003) and my personal favourite, the various Futurama (1999-2003) Christmas specials with a killer robot Santa. Not to mention a bunch of Santa slasher films with the likes of the All Through the House segment of Tales from the Crypt (1972), Black Christmas (1974), Silent Night, Deadly Night (1984) and sequels, To All a Good Night (1980), Christmas Evil/You Better Watch Out (1980), Silent Night (2012), All Through the House (2015) and Good Tidings (2016). There have been other Christmas horror films too with the likes of Jack Frost (1997), Santa’s Slay (2006), the Finnish-made Rare Exports (2010), Santa Claus vs. the Zombies (2010), and recently a number of Krampus films beginning with the high-profile Krampus (2015). A Christmas Horror Story appears to have been made by the alumni of the Ginger Snaps series – Grant Harvey, Steve Hoban and Brett Sullivan. Of the three, Brett Sullivan was editor on Ginger Snaps (2000) and made his directorial debut with the first sequel Ginger Snaps Unleashed (2004), while Grant Harvey acted as second unit director on Ginger Snaps and went on to direct the second sequel Ginger Snaps Back: The Beginning (2004). Steve Hoban produced all three films along with other Canadian genre works such as Blood & Donuts (1995), Wolves (2014) and several Vincenzo Natali films with Nothing (2003), Splice (2010) and Haunter (2013), as well as one previous Christmas horror film with the remake of Black Christmas (2006). Hoban makes his theatrical directorial debut here. Harvey, Hoban and Sullivan have chosen to make A Christmas Horror Story as an anthology. No problem with that – there have been a number of multi-director anthologies before and the idea has been on the rise in recent years with the likes of The ABCs of Death (2012), V/H/S (2012) and sequels, among others. On the other hand, they have made some decidedly odd choices. One of these is that all the stories take place simultaneously and the film keeps cutting back and forth between story strands, something I do not believe I have seen an anthology do before. This tends to be disruptive to the building atmosphere – you are just getting into the mood of one piece when it jumps tracks to another story. The other is the peculiarity that you never know which director was responsible for which story – not even the end credits delineate who did what. A Christmas Horror Story is slickly made, if a film where it seems that so many cooks in the broth have caused it to pass by efficiently but without memorable distinction. The episodes are nothing standout. Both the Krampus and haunted school stories achieve mild atmosphere but never anything that is distinctive or standout, while the school ghost story is not that well tied to the film’s overarching Christmas horror theme. The effects team do deliver an impressive looking Krampus – making A Christmas Horror Story oddly one of three films in the 2015 season that have dealt with this somewhat obscure figure from Germanic folklore alongside Krampus (2015) and Krampus: The Reckoning (2015). The changeling story is okay but again nothing memorable. 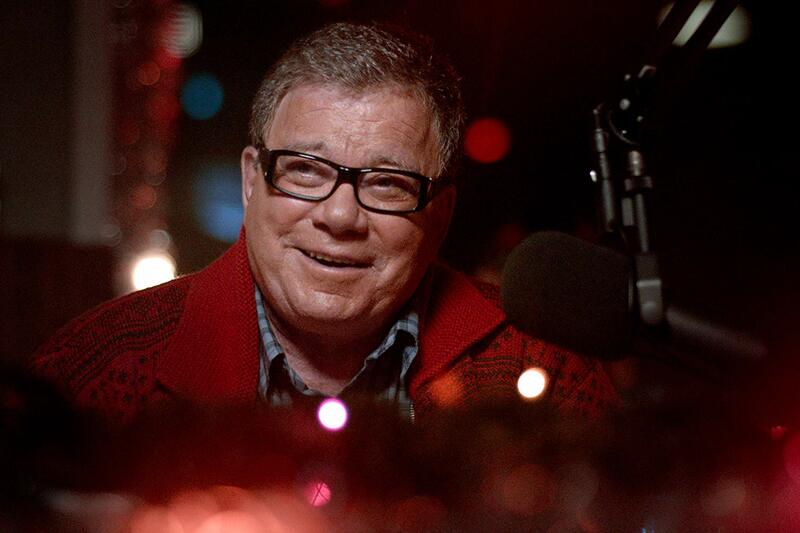 William Shatner serves in effect as the narrator, although the end the film arrives at reveals that he is actually part of one of the stories. As the gregarious, half-drunk radio host, Shatner is perfectly in his element and plays to the gallery with immensely entertaining regard. The most entertaining segment for me was the Santa one, which opts for a far more fantastical setting than all the other segments. The images of Santa hacking up zombified elves with axes hits the right malicious anti-Christmas sentiment that you wish the film had conducted more in the way of. The most effective aspect however is the twist ending that completely throws everything we have seen throughout the segment on its head.